Head towards Norwalk on the Post Rd., turn right at Trader Joes/Rory’s on to Kings Hwy North. Immediately after you go over I-95, turn right onto Parklands Drive and continue past the buildings to the entrance to Dunlap/Selleck’s Woods. 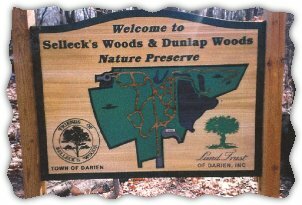 Although technically two different properties, SELLECK’S WOODS (28 acres purchased in 1963 by the Town of Darien) and DUNLAP WOODS (22 acres owned by The Darien Land Trust) are in fact one large nature preserve. 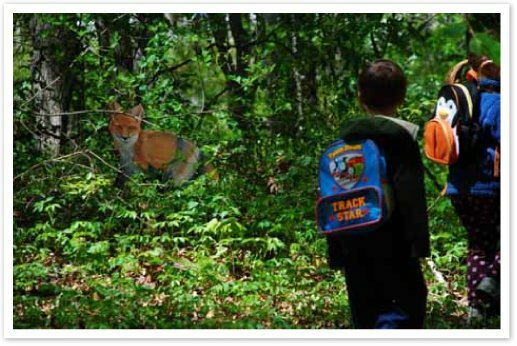 With almost 2 miles of trails, the woods are a wonderland of ecologically diverse fauna and flora. There are 7 distinct ecosystems ranging from densely wooded areas to ponds, marshes, swamps, streams and even prairie pockets. A 1997 study sponsored by the Darien Nature Center identified 114 plant species. The woods also serve an important role in maintaining local wildlife populations by providing critical sanctuary for our songbirds, shorebirds, waterfowl and small mammals. 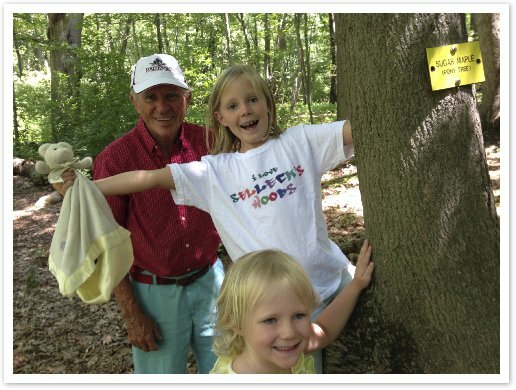 The "Friends of Selleck’s Woods" help protect the Nature Preserve status of the woods, lay trails and wood chips, organize clean ups and build bridges. We also work with the Darien Park and Recreation Commission and the Darien Land Trust to erect signs and organize field trips and nature walks. 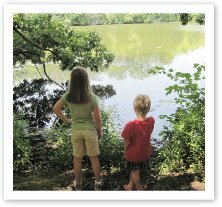 We welcome all nature groups and anyone who thinks a beautiful wildlife park in Darien is a good idea. 11am-1 pm - Bring the family, a rake and fork and join us, put wood chips on the trails and generally tidy up the woods. 11-3pm - A big celebration of the woods with: Animal exhibits, Gnome and Fairy houses, Adventure land with zip-line and archery, Food Truck and fun. WE HAVE OUR PARKING BACK. We are very much open to visitors but the construction of the assisted living "Residence at Sellecks Woods" has curtailed parking space. That will be alleviated in the early new year when the facility starts operating. In the meantime the woods are as lovely as ever and most of the fauna and flora have relished the rain interrupted summer. Look for a native rock garden adjoining the Native garden near the entrance. Next year we plan to hold a "Celebration event" to encourage regulars to go back to their usual routine of visits. Thanks to the more than 30 people who helped distribute and rake three huge piles of wood chips. Their work makes our trails safer and more enjoyable to walk. Sunny skies and cheerful chatter made for a happy few hours. April showers are ensuring that there is enough moisture in the soil to make for a green and colorful Spring. Our annual TRAIL FIX is scheduled for SUNDAY April 23 from 11-1pm. Join us! Our ENTRANCE - The first office building on Parkland Drive will be demolished and rebuilt as a place for assisted living (dates to come). But don't worry, access to our woods entrance and parking lot will be provided. We have our first snow of the winter. Twelve pines and Holly Trees tree have been planted near the Little Brook Rd entrance as a buffer to the Rail track. Large scale removal of invasive Green briers carried out. Thank you for all those who joined us for nature activities and fun for the whole family on our 3rd biennial Trails Discovery Day. It was held on Sunday September 11th from 11am to 3pm in Dunlap/Selleck's Woods. It included Nature Scavenger hunts, Hands-on Animal Exhibits from Animal Embassy, Learn the Trails map reading/hiking, I-Spy Corner bird/animal sightings, a great Food Truck, Music and Fairy houses, and fifty acres of nature preserve fun! New bridge to the lake completed. Railings added to entrance steps. Stepping stones up lake ledge. See our Xmas tree decorations. MERRY CHRISTMAS! 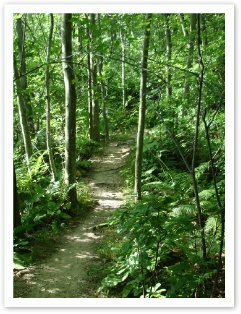 We are a private 501(c)3 non-profit organization that cares for Selleck's Woods on behalf of the Darien Parks and Recreation Commission. and the young, a source of wonder and growth." Preschoolers at "I Spy Corner"